Smithy is the main antagonist and final boss of Super Mario RPG: Legend of the Seven Stars and the titular leader of the Smithy Gang, an organization that attempts to rule over Mario's World during the events of the game. In order to do this, Smithy tried to get rid of the power of wishes from the world, and, in its stead, filled the world with weapons. 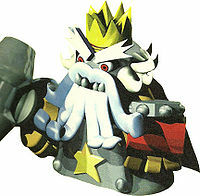 He is a dark-grey mechanical creature that wears a gold crown and has an extremely long white beard; the Nintendo Player's Guide has compared his appearance to that of Santa Claus. He hails from another dimension, a dimension that is accessible by the gateway Exor. In his dimension, he resides in his Factory, where, day and night, Smithy creates anthropomorphic weapons which he uses against other worlds. It is also implied during the final battle that multiple versions of him were made, and that there were possibly plans to mass-produce him, due to the various heads littered in his final battle arena. Smithy's name is derived from the word smith, which is someone who manipulates various metallic materials and metallic alloys, such as a blacksmith. A smith's workshop is sometimes called a smithy as well. Prior to his invasion, Smithy gets a giant sword, Exor to occupy Bowser's Keep, and Exor shatters the Star Road, the source of wishes in the world. Once there, Smithy defeats Bowser and the Koopa Troop and establishes his base of operations in Bowser's Keep of Mario's World (while Smithy's Factory remains the main headquarters of the Smithy Gang). Smithy then sends his lieutenants to retrieve the Star Pieces after learning the pieces have potential to restore wishes to the world. Smithy did not want anyone returning the Star Pieces to Star Road, as the road's recovery would allow the power of wishes to counter the power of the Smithy Gang's weapons and interfere with his attempt of world conquest. Mack occupies Mushroom Kingdom and acquires the first Star Piece. Bowyer occupies Rose Town and acquires the second Star Piece. Yaridovich occupies Seaside Town and acquires the fifth Star Piece, which was previously owned by Jonathan Jones. The Axem Rangers occupy Barrel Volcano and acquire the sixth Star Piece, which was previously owned by the Czar Dragon. However, Mario and his allies Mallow, Geno, Princess Toadstool, and King Bowser prevent Smithy from carrying out his plans, and they obtain the Star Pieces from his lieutenants. They then arrive at Bowser's Keep and enters Smithy's dimension via Exor. Once they confront Smithy, he is busy creating new weapons and is revealed that he has the last Star Piece embedded in his body, presumably to prevent anyone from restoring the power of wishes to the world. Smithy calmly asks Mario to turn over his Star Pieces, where Mario refuses and battles Smithy instead. Smithy wields a giant metal sledgehammer in battle, which he uses with his right hand. The fingers of his left hand have been fitted with small projectile launchers which he uses to fire bullets at Mario and his allies. Some of Smithy's magical powers involve summoning a giant wooden sledgehammer to crush Mario and his allies and summoning meteors. In battle, Smithy is also aided by Smelter. 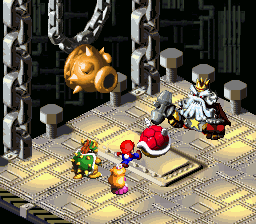 Smelter produces molten metal from his mouth, which Smithy then shapes into Shypers, who will immediately enter the battle and begin attacking Mario's party. After Smithy is defeated, he becomes infuriated and begins slamming the floor with his sledgehammer. A few of his minions arrive, begging him to calm down and to stop smashing the floor (as the foundation was just built the day before). However, Smithy ignores their warnings and continues pounding the floor. As a result, the floor collapses; Mario, his allies, and Smithy fall into the basement of the factory. Once there, Smithy reveals his true form: a metal shape-shifter. The normal Head, which he uses to switch to the other heads. The Tank Head, which has extremely powerful physical attacks. It also has high physical defense. The Magic Head, which has the most powerful magical attacks in the game, but has weak defense. The Mask Head, used for increased protection and defense. It boasts the highest physical defense. The Treasure Head, which attacks Mario's party with a random status ailment. 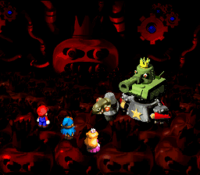 After Smithy is defeated, Mario and his allies overheat his body, which then explodes as a result, and the last Star Piece is recovered by Mario and his friends. With all seven Star Pieces in hand, Geno is able to repair the Star Road and restore the power of wishes to the world and thus ends the Smithy Gang invasion. At the end of the game, a parade is held in celebration of the end of the invasion. Smithy, in his original bearded form, appears during the parade, riding atop Blade. Many Shysters and several of his lieutenants also appear alongside Smithy. As he flies by on Blade, he pounds his minions Mack, Bowyer, and Yaridovich with his sledgehammer. 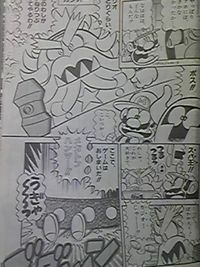 Smithy appears in the Super Mario-Kun volume adaption of Super Mario RPG: Legend of the Seven Stars. He still serves as the main villain and has the same role as he did in the game. Although originally depicted as a calm and collected leader, Smithy is revealed to be highly ill-tempered, as shown by his fit of rage upon being defeated the first time by Mario and his allies, which culminates in Smithy destroying his recently built headquarters. Additionally, in the aforementioned fit of rage, Smithy apparently destroys three of his henchmen who are simply trying to calm him down. Ultimately, Smithy is determined to achieve world conquest through the Smithy Gang, confident that his weapons can serve as the basis of his power. As such, Smithy attempts to prevent the restoration of wishes, since the Star Road and the dreams of individuals represent a direct threat to Smithy's reign. "This isn't good at all!" Spells Mute Spell, "Fear Spell", "Poison Spell", "Scarecrow Spell"
"Huh...? Already finished your tour of the factory, huh?! All right, then! How about a little demonstration?" "Huh? ...Gufaw haw haw! So YOU'RE... Mario?! Looks like we're gonna have a little dispute over the Star! "Hurrumph! Better yet... Why don't YOU give me YOUR stars. Why, then I could easily conquer this world! Then we could get rid of wishes, and create a world filled with... WEAPONS!!" "Over here, now! I'll crush you ALL!!!" "Huh?! What the...?! How in the heck...?!" "NOOOOOOOOOOOO...!!! Uwoooooooo... I'm burning... seething... Never have I been so wronged..."
"It is time... I will show you my real form... I will show you my true power... I will teach you some respect... And I shall have my revenge! NOOOOOOOOOOOO...!!!" "Guooooooo!!!!! Come on, you puny ants!" "Mwa ha! I am burning with power!" "Guooooooo! My b...body and head are burning! It's not... possible...! I don't believe it...! I'm... finished... done for...! Guooooooooo... noooooo...!" Smithy was a character nominated for "Best Villain" in the 1996 Nintendo Power Awards. He received third place. Smithy lost to Bowser (from Super Mario 64), who received second place, and Boba Fett (from Star Wars: Shadows of the Empire) who received first place. Smithy's Japanese name, "Kajiō," was romanized as "Kajidoh" in the official soundtrack for Super Mario RPG. Smithy's standard head in his second form only remains during the first few turns of the battle. Once he first changes his head to a new form, his original head will never return aside from brief appearances in between form changes. His rain attacks may represent some of the members of the Smithy Gang. Spear Rain represents Yaridovich, Sword Rain represents Mack and/or Exor, and Arrow Rain represents Bowyer. ↑ Super Mario RPG: Legend of the Seven Stars Nintendo Player's Guide, page 104. This page was last edited on March 5, 2019, at 13:42.